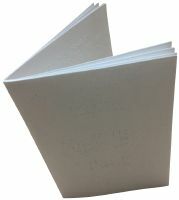 Include Braille Rules on How to Play Bingo for $5.00? Everything you need so everybody can play Bingo. 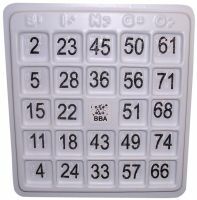 Included are 4 unique Bingo Playing Boards, markers, Bingo call numbers, and a package of Bingo Call Boards. Numbers are provided in Braille and print. It's true that the most popular venue for Bingo is a huge party or official tournament. But that's not the only way you can play. Arguably, it's even more fun to play in a small group, because everyone knows everyone else and can help younger ones check numbers and place markers. Yes, the small group we're thinking of here is a family. The beauty of a family game is the person calling out the numbers can also join in the fun. So, for your All-American family, here are all the supplies you'll need. Included in this package are four unique Bingo Playing Boards - and the markers to go with each board. You'll also receive the Bingo call numbers, which the Caller will draw at random and announce to the group. Finally, we'll even throw in a package of Bingo Call Boards, so you can place the numbers that have already been called in sequence for verification later. Of course, all of these supplies have both Braille and regular print on them, so everyone can read and enjoy the game. Just like Golf, Hockey or Soccer, you need the right tools to play a good game. So here they are. Pick up our new Bingo Family Pack, and let the fun begin! 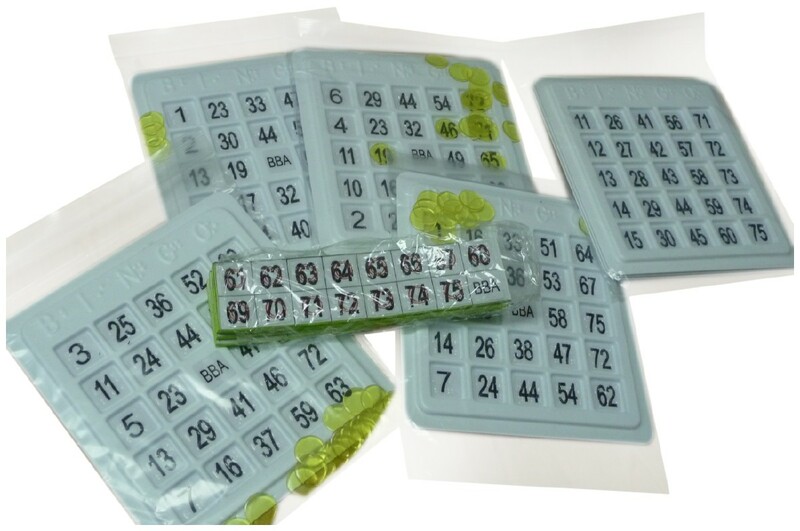 We have Bingo Family Pack (Brailled) in stock, delivered with free shipping. Click below to order. Bingo was made popular by a traveling salesman who adapted it from a game he saw at a carnival in 1929. The game was called "Beano" and was played by covering the numbers on a card with beans. The goal in Bingo is to fill a vertical, horizontal, or diagonal line on a gridded card by matching combinations of letters and numbers. It's a great old-fashioned parlor game that the whole family can play! Getting Started. First, name one person in your group to be the caller. The caller takes a bag filled with numbers from 1 through 75, such as our set of Print-Braille Bingo Call Numbers. Next, each player receives a specially-prepared Bingo card. Each card has 25 numbers on it, ranging from 1 to 75 in 5 columns. Each column is labeled with one of the letters in the word BINGO. Finally, place a marker in the center Bingo square. This is considered a free space. 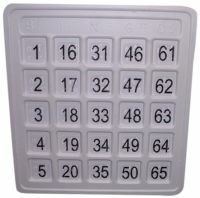 Our Print-Braille Bingo Playing Boards come with plastic markers you can use to mark squares, but if you have misplaced them, you already have fun markers around the house. Just give the kids pennies, chocolate chips, gumdrops or nuts to cover the squares as the numbers are called. Playing the game. One at a time, the caller will draw a number from the bag, and call it out. "B10!" Look in your B column of numbers, to see if you have the number 10. If you do, place a marker on that square. Continue to listen to the numbers being called, and mark any squares that match. Continue playing until one player has covered a vertical, horizontal, or diagonal line of five grid spaces on their card. As soon as you have marked five consecutive squares on your card, call out "Bingo!" The first player to get Bingo wins the game. You can make it extra fun by having a few small prizes available to reward the winners.